Biodegradable cutlery, recyclable plastic cups, sustainable to-go containers—new eco-friendly products seem to pop up everyday. While these eco-friendly alternatives are a step in the right direction, it’s often clear where and how they should be disposed. In this Recycling Refresher Guide, we’re going back to the basics to solve the everyday mysteries of recycling at home and in the office. Check out the guide below for basic recycling tips and a brief look into composting, TerraCycling and e-waste recycling. But first, why should you recycle? Recycling drastically reduces the amount of waste sent to landfills and incinerators. It goes without saying that landfills are one of the largest sources of human-related greenhouse gas emissions. In fact, landfills were the third-largest source of methane emissions in the US in 2016. The less plastic sent to the incinerator, the less methane in the earth’s atmosphere, and the less potentially harmful pollutants in our air, water, and land. Recycling curtails the harvesting of new raw materials. Recycling helps to reduce our reliance on ‘virgin’ metal, plastic, and glass products, ultimately conserving natural resources such as timber, water, and minerals. Collecting raw materials, such as ore, and turning them into usable materials such as plastic, metal, or glass requires a significant amount of energy. Transforming recycled materials into usable materials, however, takes much less energy. The resulting energy savings varies among materials. Recycling glass only saves about 10-15% of the energy needed to make it from scratch, while recycling aluminum saves 94% of the energy needed to create aluminum from ore.
Cardboard, glass bottles, aluminum cans, newspapers—most people recognize that these items belong in the recycling. It’s no surprise then that the five most commonly recycled materials are aluminum, glass, paper, plastic, and steel. Among these groups, aluminum likely yields the most energy savings, as recycling aluminum saves 94% of the energy it takes to process the raw ore (also known as bauxite) and doesn’t decrease the quality of the metal. Some manufacturers even claim that they’re able to put a recycled can back on the supermarket shelf in as few as 90 days. Within the category of plastic, plastic bottles held the number one spot in 2015 as the most recycled plastic product in the US. Did you know that recycling 10 plastic bottles will conserve the same amount of energy it takes to power a laptop for 25+ hours? That’s some serious savings! So know what should be recycled… but do you know where and how? 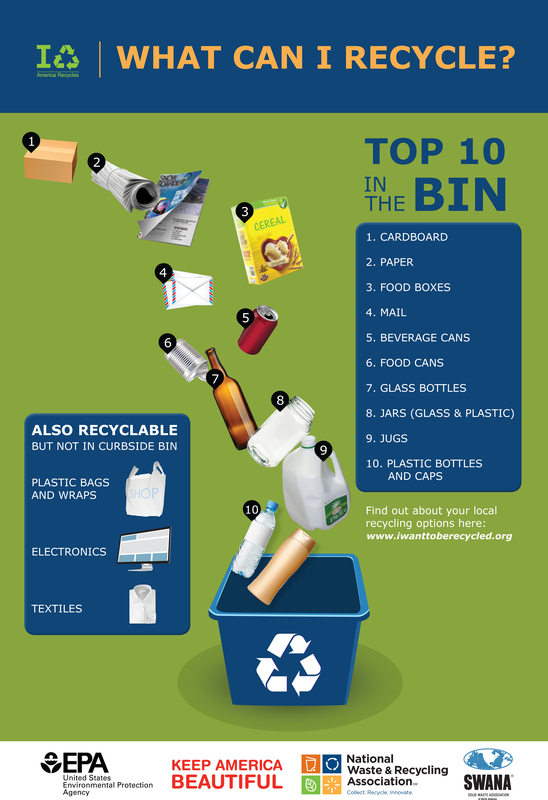 Check out the recycling tips below for a refresher! Where should you toss a bottle or can? Find the green or blue recycling bin. Some public containers might have lids with bottle-sized slots in them, indicating the container is solely for plastic, glass, or aluminum recycling, as opposed to paper. If there’s visible residue, give your bottle or can a quick rinse. Don’t waste water scrubbing your bottles and cans: a simple swish of water will do the trick! If the container held a stickier substances (such as a juice or smoothie), it may require an extra scrub. Check with your local facility to see if plastic bottle caps are accepted. Plastic bottle caps are often made from a different plastic resin than the bottle itself as your local facility might only accept the bottle. Remove bottle caps made from aluminum or metal. While aluminum and metal are recyclable, lids made from these materials often pose problems for recycling machinery. (Some facilities, however, can sort and recycle metal caps; check with your local service for best practices.) Send your metal caps to a metal recycler for reprocessing instead. Should I crush my bottles and cans before recycling? It depends. If you or your office has single-stream recycling, it’s best to not crush your bottles, as they will be harder to sort at the recycling center. (This may not be the case in all locations; check with your local center for more accurate information). If you have access to multiple-streams of recycling, it’s more acceptable to save space by crushing your bottles and cans. One of the most recycled products in the US (in 2015, almost 67% of paper was recycled), paper still constitutes 33% of the materials that end up in the trash. Not sure where to toss your paper? Look for the blue or green recycling bin. Dual-stream and single-stream recycling programs will either use a blue or green container to indicate paper recycling. Some public bins might have a lid with a thin slot, indicating the container is purely for paper recycling. Don’t let your paper recycling get wet. Wet paper and cardboard will not be processed by your recycling facility. Flatten your cardboard boxes to maximize the space in your recycling bin. Your neighbors, office manager, and waste management service will thank you. Buy recyclable gift wrap or reuse newspaper. Each year, Americans throw out more than 4 million tons of wrapping paper. Reduce your waste by purchasing gift paper without a laminated or plastic outer coating. Think twice when recycling paper with a plastic lining. Consult your local waste management service to find out what the local recycling facility is able to process. According to National Geographic, about 91% of the plastic on our globe has not been recycled. Furthermore, over half of the plastic manufactured ends up in a landfill within a year’s time. Some studies indicate that there will be more plastic than fish in our oceans by 2050. Before tossing your plastic, check the symbol. You’ve probably noticed a small triangle with a number inside of it on plastic containers before. This symbol indicates the type of resin used to create the plastic, thereby helping the consumer know where, how, or if it can be recycled. Consult with your local waste management service to find out exactly which kinds of plastic it supports. Note: the green triangle does not indicate a product is recyclable; it simply identifies the type of plastic. Don’t worry about peeling off the labels. Most recycling facilities are able to easily get rid of labels during processing. If a container clearly has a paper label, consider recycling it with your paper rather than your plastic. How much do I have to clean my peanut butter jars before recycling? Much less than you think. Scrape out as much of the residual product as possible, but don’t worry if the jar isn’t sparkling clean. Most recycling facilities will thoroughly clean your plastic before processing it. For information on plastic bags and other films, see the below. Typically made from corrugated cardboard, pizza boxes are recyclable if they have not yet been used. Once the box is soiled with pizza, calzone, or hot wings grease, it is no longer recyclable. These oils cannot be removed from the cardboard or paper during the initial pulping process used by most recycling facilities. Broadly speaking, food is one of the biggest sources of paper recycling contamination. Think twice next time you recycle your takeout containers! If they’re made from paper and saturated with oil, they don’t belong with your recycling. Can I put my recycling in a plastic bag? The type of container or bag you use for your recycling matters, especially if you have curbside collection. Do a quick search for your city’s regulations to find out exactly which bags or trash bins you should be using. Plastic bags pose serious and costly problems to recycling machinery. Unless your city explicitly mandates a specific type of bag, it’s best to avoid putting your recycling into plastic bags. No matter your city’s regulations, you should never use the small plastic bags you get from the grocery store for your recycling. As this video of a recycling facility in Chicago exposes, plastic bags present serious issues for a facility’s machinery and staff. Before entering the sorting machine, employees attempt to remove all plastic bags from the batch. Many, however, slip through and end up wrapped around the machinery that helps to sort the recycling. Removing these tightly-wound bags from the machinery is both a costly and lengthy process. This ultimately wastes time the facility could otherwise spend turning recycling into new raw materials. So what should you do with plastic bags? Well, in many cases, you can recycle them. The majority of plastic bags are made from #2 or #4 plastic (also know as high-density polyethylene or low-density polyethylene), both of which can be recycled. Many grocery stores have collection bins for plastic bags, making it fairly convenient to get rid of them. To find a plastic bag recycling location near you, use this locator. The symbols for #2 and #4 plastic. If you can’t identify the type of plastic, err on the side of caution and reuse the bag rather than recycle it. Many eco-champions avoid the trouble of recycling plastic bags by using reusable tote bags at the grocery store or repurposing plastic bags for storage or organization. Here at Bevi, we love these reusable tote bags made from 100% recycled plastic bottles. Check out Enviro-tote.com to get your own custom reusable bags. To find out more about how and where to recycle bags and other plastic films, see here. Where and how can I get rid of my recycling? What happens to it next? Whether you’re interested in recycling at home or in the office, there are several ways to manage to your recycling. Many municipalities offer curbside collection of paper and plastic recycling, and most communities have privately-owned or volunteer-run drop-off centers as well as deposit programs at the local supermarket. These services ensure recycled materials make it to the proper facility, yet it’s up to you to sort your recycling and trash beforehand. Located in Boston, Save That Stuff is a privately-owned recycling and waste services company that collects everything from vegetable oil to oyster shells. Once collected, your paper and plastic waste is transported to a facility where it will first be sorted, then cleaned, and eventually processed into materials than can be resold and purchased as if they were raw materials. This process not only leads to energy savings, but also helps create new jobs. The 2016 national Recycling Economic Information (REI) Study found that for every thousand tons of material that was recycled, 1.57 new jobs were created. Not too shabby for properly sorting your paper and plastic! What is composting and what goes into the compost bin? Composting is a natural process in which organic matter decomposes into a nutrient-rich material called humus, or the more colloquial term, compost. Like recycling, compost turns trash into treasure: unwanted food scraps and lawn clippings transform into healthy soil that retains moisture, prevents plant pests, and reduces the need for chemical fertilizers. As a rule of thumb, you can compost anything that was once alive. However, there are a few exceptions. You should generally avoid things like fatty meats and cheeses, as well as pet waste, to prevent unwanted pests and the spread of diseases. Unlike curbside recycling, which has become a standard in most communities, curbside composting is more uncommon. This makes it quite difficult for individuals and offices to dispose of their food waste in an easy and eco-friendly manner. One option is to start a compost heap in your own backyard. This works particularly well if your yard has a lot of tree-cover, as the compost heap will require dead leaves, branches, or twigs to stay healthy. Paper, plastic and compost bins in an office. If your home or your office does not have any outdoor space, there are many privately-operated services you can use to have your compost collected. (Here in Boston, many homes and businesses use Bootstrap Compost.) While they’re an additional expense, these services make composting just as easy as recycling. You do your part to separate your organic waste and the service does the rest! Here at Bevi, we love our sustainable beverages, but we also love to snack. TerraCycle makes our snacking a guilt-free experience. TerraCycle turns trash into treasure. TerraCycle uses their Zero Waste boxes to collect ‘unrecyclable’ materials, such as snack and candy wrappers, from consumers around the country. They then reprocess these typically ‘unrecyclable’ products as practical, affordable products, thereby keeping them out of the landfill. While these zero waste boxes are on the expensive side, they’re a worthwhile eco-investment for your home or office. As far as we’re concerned, TerraCycling is the next best thing to reducing (or reusing) your plastic waste. How do I get rid of electronic waste? Even if you’re an eco-champion, E-waste is a difficult waste stream to manage. Electronic waste, also known as e-waste, refers to consumer and business electronic equipment that is near the end of its life or no longer functioning. Things like blenders, microwaves, computers, keyboards, and cell phones all fit into the loosely defined category of e-waste. The proper disposal of e-waste is critical to keeping harmful chemicals, such as the flame-retardants, out of our eco-systems. Before recycling your e-waste, first check if it can be repaired or donated. If it’s truly unusable, find an e-waste recycling center or service near you to ensure its proper disposal. Many companies even offer a special plan for offices, making it easy and convenient to get rid of e-waste at work. Remember: recycling is a last resort. Do your best to reduce and reuse! The best way to conserve natural resources and keep trash from pilling up in the landfill is to reduce our reliance on single-use products, thereby reducing our overall waste. When you factor in the energy used to produce and transport one-time-use products, it’s clear that our land, air, and oceans cannot sustain this level of pollution. This is exactly what spurred Bevi Co-Founder Eliza Becton to out-design the notorious plastic water bottle. After learning of the Pacific Garbage Patch, Eliza knew she had to do something to stop the sea of plastic waste from growing. But what? She knew it would be impossible to guilt people into changing their behavior. Instead, she knew she had to design something so efficient, so eye-catching that people would change their behavior voluntarily. The idea for Bevi was born. To make her vision a reality, in 2013 Becton teamed up with two friends, Sean Grundy and Frank Lee, who shared her interest in sustainability. Together they began prototyping a water machine that would provide healthy fizz and flavors on demand, encouraging people to use reusable bottles rather than relying on single-use plastic bottles. Today, Bevi’s smart water dispensers have saved the waste generated by over 54 million plastic bottles.